I read this article and found it very interesting, thought it might be something for you. The article is called How China Beats India In Agriculture Productivity and is located at https://archive.indiaspend.com/sectors/how-china-beats-india-in-agriculture-productivity. Could India’s track record in agricultural output have been better than what it is currently? As IndiaSpend has written in recent weeks, deficient monsoons usually turn the spotlight on these questions. Dhritiman Gupta & Sourjya Bhowmick dive back into agriculture productivity figures in isolation and this time in comparison with China to come up with several findings. An India vs China comparison – both are large countries with similar sized populations and same common food consumption habits – is interesting. For starters, China has less area under cultivation, consumes less fertiliser and yet produces more. Total foodgrain production of China touched 571 million tonne in 2012 as compared to India’s 250 million tonne in 2011-12. Agricultural productivity, to be fair, also depends on a variety of factors like soil quality, availability of water, use of fertilizers and use of high yielding variety of seeds. But productivity also becomes important in India because roughly 50% of the population still derives their livelihood from agriculture. IndiaSpend has earlier written that India’s irrigation coverage was a poor 48.3% of total cultivated area as late as 2008-09. Which means a bad monsoon can cause havoc. Let’s now look at the top five producing countries for two crops – paddy (rice) and wheat – for the year 2009. Note: We have taken paddy and wheat because they are the most important food grains. However India’s performance remains poor even if we take other crop categories into account. The first thing to note from (Table 1) is that India was the second largest producer of both paddy (rice) and wheat behind China. However, India lagged in productivity levels. India had the worst productivity of 3.1 tonne/hectare in paddy against a world average of 4.2 tonne/hectare. In wheat production, India stood fourth among the top five countries with a productivity of 2.9 tonne/hectare. The only country behind India was Russia. Now, let’s look at some countries and see how much fertiliser they used per hectare in 2008 (This is not an argument for use of fertiliser). We will look at a few Asian countries, especially the ones that had higher productivity than India in rice production. Incidentally, fertiliser use has steadily gone up in India since 1950-51 when only 0.6 million tonne (Nitrogen, Phosphorous and Potassium variety) was used. In 2010-11, the fertiliser use stood at 2.8 million tonne. As Table 2 shows, the relation between fertiliser use and productivity is not very obvious. China, the most productive country in wheat and rice, used much less fertiliser than India, which was the second largest producer in both crop categories. 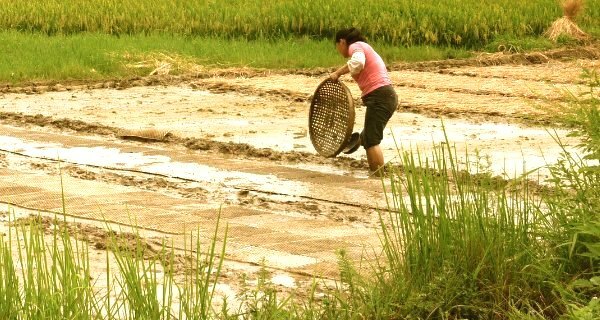 Vietnam, which was ranked 2nd in paddy productivity, used the maximum fertiliser among the top 5 countries. Indonesia, which was 3rd in terms of productivity, used the least amount of fertiliser. India used a lot of fertiliser: 138.6 kg/hectare but failed to increase productivity to the levels of China or Vietnam. So what could be the reasons for India lagging China in agricultural productivity? Vegetable Basket Programme: Started in 1989, the VBP project aims to increase production and utilise natural resources reasonably. In the first five years, 14.05 billion yuan in investment (roughly Rs 12,290 crore) was used for scientific and technical development. By 1997, output of almost all products had increased by 10%. Incidentally, this programme concentrates more on non-foodgrain products. In India, the reliance is more on basic foodgrains like rice and wheat. Returning Grazing lands to Grasslands: This was an important programme for China’s development. It was started with an accumulated investment worth 9.319 billion yuan (Rs 8,152 crore) and more than 30 million hectare grazing lands has been turned to grasslands. China has also started collective water management. Under this programme, villages hire a manager who operates directly under local government directive. Water managers collect water-use fees from farmers. This may or may not be an accurate comparison as the figures may not match but India’s agriculture budget (2012-13) is Rs 27,931 crore. In contrast, China spent, as per media reports, $164 billion on agricultural products, around Rs 913,398 crore. In general, increasing agricultural productivity in India would depend on better irrigation coverage, more effective use of fertilisers, farmer education and soil management. But steps like the Accelerated Irrigation Benefit Program (AIBP) to several fast-track irrigation initiatives have not yielded results. These are of course general pointers and not an agriculturist’s prescription. The data however is something to ponder over. I wanted to thank for for putting together this insightful article. Sad, but it did open up some healthy discussion among me and and friends. Hopefully, such discussions across various groups will bring about creative solutions for improvement. Keep up the good work – much appreciated. I am interested to have a comparaitive study of prducivity of grain , milk production etc of different countries. I am am a farmer aged 74. A poor country like India with unfertile land, water constraints, corruption, high labour, non-use of simple mechanical devices and bifurcated land needs redressal. Organic farming has turned coastal Gujarat, Rajasthan and similar infertile land to plantations. India needs this and reasonable procurement by government.